Thousands of male and female residents of Itikaf City were in rapt attention as Dr Tahir-ul-Qadri spoke on the odd night of Ramazan. 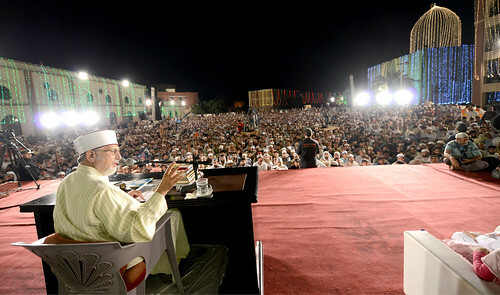 His speech was broadcast live through Pak TV and Minhaj web TV. Dr Qadri said that our forefathers and elders would give more attention to learning good manners and conduct than acquisition of knowledge, for one learns effective use of knowledge only through excellence of morality. He said that excellence of morality is when one forgives excesses of the people with one's chin up, stating that this brings one closer to Allah Almighty. The MQI leader said that the more one is well-mannered and courteous towards others, the more perfect a believer one will be. He said that forgiveness in matters related to fulfillment of rights of people is not granted even by performing Hajj unless he whose rights have been violated pardons. He said that the Holy Prophet (SAW) termed excellent conduct as biggest blessing of Allah. He said that the highest station of paradise will be populated by the people with excellent morality. He said that Allah Almighty has promised His nearness and mercy to those who have excellent morality.